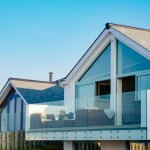 Winner of the 2010 LABC South West Building Excellence Awards for Best Individual Dwelling. 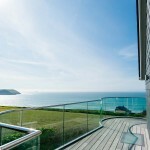 The Sea House Porth is an extensive five-bedroom house situated in a stunning cliff-top location in Porth, north Cornwall. Architects designed the three mono-pitched slate roof elements to have the appearance of smaller structures, enabling the building mass to sit comfortably on its site, overlooking Porth beach. A spiral staircase sweeps down into the main living space opening the room out to sea-facing views. The open plan living space includes a bespoke Mark Wilkinson kitchen with many other custom-designed touches to add luxury to the overall finish. A games room, indoor heated swimming pool and garden room add leisure spaces to the interior and balconies open out from the first floor bedrooms and living spaces.